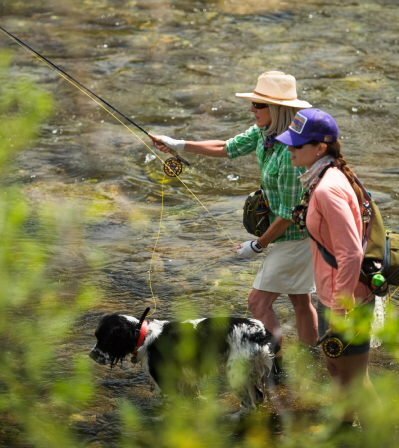 We invite you to join us for 3 nights of fun, fly fishing and learning in the Great Smoky Mountains. Festivities kick off when you join us on THURSDAY afternoon to get settled in to your Luxury Glamping accommodations by the river and enjoy a wine and cheese Welcome Reception around the campfire. FRIDAY starts the day with a group breakfast followed by streamside instruction on reading the water by Charity Rutter of R&R Fly Fishing. Then we will pack up our lunches and head into the Great Smoky Mountains National Park to explore some of the 1,000 miles of the wild trout streams. Dinner will be served at the clubhouse followed by time around campfire or in the pool Friday night. SATURDAY will be filled with more time on the river and lots of time for laughs and stories around the campfire after dinner! We’re planning a fun cook out for Saturday night! SUNDAY morning check out at your leisure and have a lovely brunch before we leave camp. Pair up with a buddy to spend the day on the river, or take your time to explore the area before you head home. Townsend and the Great Smoky Mountains National Park have so much to offer. Our “Glampsite” is steps away from Little River and you can see the entrance to the Great Smoky Mountains National Park from Camp! Each Luxury Glamping Tent includes: 2 Bedrooms/1 Bathroom/Kitchenette/Indoor Dining Space/Covered Porch. These tents marry the magical wilderness atmosphere with the comforts of home with a view of the river. Accommodations are furnished with generous amenities including plush bedding, a bathroom and heat & air conditioning. Your tent features an extra level of luxury with a covered porch, wooden interior walls. The tents marry a magical wilderness atmosphere with the comforts of home with a view of the river. Accommodations are furnished with generous amenities including plush bedding, a bathroom and heat & air conditioning. Your tent features an extra level of luxury with a covered porch, wooden interior walls separating living spaces, as well as a small kitchen and dining area. We have 3 Luxury Glamping Tents reserved for this event. All camp gear, bedding and towels are supplied in luxury tents. TN Fishing license with a trout stamp is recommended for our camp. You can get licenses in advance online at Tennessee: https://license.gooutdoorstennessee.com/Licensing/CustomerLookup.aspx. Since we are camping on the river just outside of the National Park boundary, a trout stamp is required to fish the waters at camp. Fishing for rainbow trout and smallmouth is good through camp. Your TN fishing license is good for fishing in the Great Smoky Mountains National Park wild trout streams. Lightweight Waders & Felt Sole Wading Boots: Rubber sole boots are a poor choice for wading in the Smokies and are dangerous. Felt soles are the only ones we recommend. Since we are fishing the end of May, it may be warm enough to wet wade using only neoprene booties and wading boots. However, afternoon rain showers are common and you may stay warmer in waders. We can rent boots and/or waders with advance notice. We need your boot and wader size to bring the appropriate gear. Quick Dry/Wicking shirts and shorts/pants. Wearing quick dry or breathable clothing and socks will make you more comfortable whether wearing waders or not. Fishing Cap – also in subdued colors for fishing the park or large brim hat for tailwater trips. Backpack, Duffle Bag or Gear Bag: With all the gear and accessories you’ll be bringing, we recommend you put all your belongings in a bag for easy transport as we head up the river. Pack your favorite camp clothes for 3 nights at camp and 3 days playing in the river. Toiletries – each Luxury Tent has a bathroom with shower. There are also additional bath houses at camp. River/Beach Towel if you choose to swim while at camp. 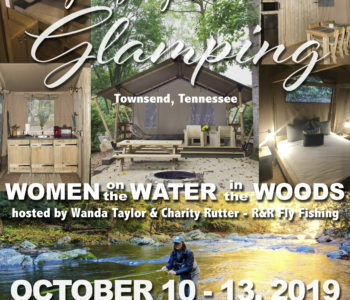 Event will be held at a Townsend campground at the entrance of Great Smoky Mountains National Park in Tennessee. 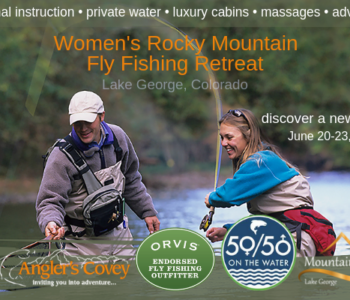 Chandler Lake Camps and Lodge in support of the Orvis Company and 50/50 On the Water initiative has created a unique and exciting women’s fly fishing experience. Offering a great way to rediscover and cultivate your passion for fly fishing. 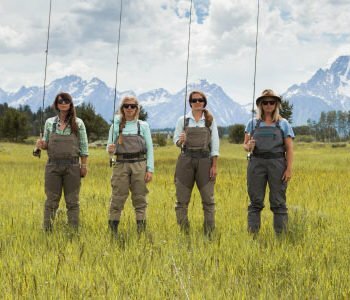 Our goal is to bring women together for the sport of fly fishing and adventure in Northern Maine, one of America’s most iconic landscapes. Join like-minded guests longing to leave the stresses of life behind. This 4 night, 3 day trip is primarily a wilderness dry fly fishing experience for wild Native Maine Brook Trout. The specifically chosen dates are peak for our very sought after Hex (Green Drake) hatch. We will be casting over Brook Trout averaging 14 to 17 inches with many in the 18 to 20” class. Numerous fishing opportunities with little pressure results in great success for all skill levels. Field to Table presentation. Close attention to ingredients is at the heart of all good cooking – our featured Chef will bring a wide range of wild foods into sharp and delicious focus for all to enjoy. Fly tying, casting instruction and tune-ups, canoes and kayaks all assisted by experienced Maine guides in a non-intimidating environment. We return to the lodge as our guests desire for dessert and refreshments to reflect on the casting, catching and evening’s adventures. You’ll learn tips and techniques in a fun and supportive environment supported throughout by your trip leader Megan Hess and our full staff of Professional Registered Maine Guides that are enthusiastic, knowledgeable and experienced not only with our waters but the sport and art of fly-fishing as well. All fly-fishing gear can be provided if necessary at no additional charge. Daughters, granddaughters and young women 16 years and under come free with a paid adult per youth. Pay it forward and start a family tradition today. All-inclusive pricing with experienced professional Maine guides. Our Novice School will be taught by Catherine Gordon, a Registered Maine Guide that dedicates most of her time to working with disabled veterans through the Travis Mills Foundation. The school will be four nights, three full days of instruction and will include private lodging, all meals and use of Orvis fly rods and waders if needed. 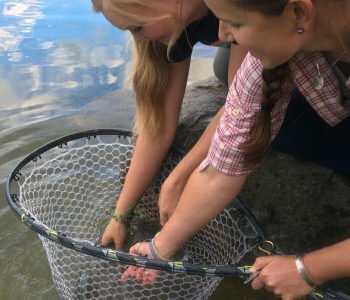 As a novice school, you will learn from the ground up – everything from rod selection, casting and knots to wading safety, entomology, fly selection and presentation. We can provide waders and fly rods and we sell licenses at our lodge. You will need all personal clothing appropriate for early summer angling in Maine. We have complete gear lists on our web site. Call our lodge at 877-796-5558 or email us at info@weatherbys.com to Register. The school will be held at Weatherby’s Lodge in Grand Lake Stream, Maine. Since the summer of 2008, spey casters representing the Northeast, the Pacific Northwest, the Midwest and even the Southern United States have gathered on the shores of the Salmon River in Pineville, New York to celebrate the culture of 2-handed rods. 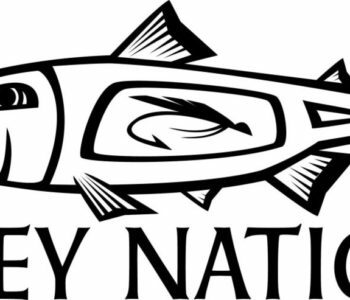 We’d love to have you join us for our 11th Annual Spey Nation celebration! 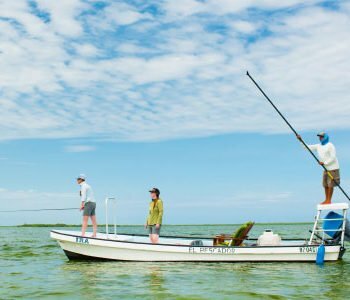 Spey Nation features a full free lunch, raffles, “On the water” demonstrations, and interaction with some of the biggest names in 2-handed casting from the East and West Coasts. 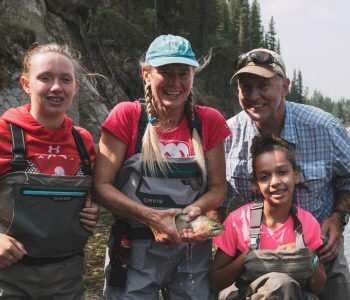 Great Lakes anglers have an opportunity to learn 2-handed techniques, try specialized equipment and talk with other fishermen in an atmosphere dedicated exclusively to 2-handed casting. Spey Nation is free to attend. Lunch and demo gear provided – please bring your waders and a lawn chair! All profits are donated to the Fish Creek Atlantic Salmon Club. Their mission is to enhance and promote the return of Landlocked Atlantic Salmon to the Oneida Lake watershed. Each day allows for relaxing and meditative time for you to choose how to spend. Greet the day with coffee and reflection on the patio, schedule an in-room afternoon massage – one is included with your registration. Rest and relax, journal and meditate. Each afternoon/evening we will host a fly fishing seminar to discuss your questions, instruct on some basics such as knot tying, rigging, entomology, fly selection, and more! You’ll visit a 110-acre private historic ranch surrounded by national forest. Enjoy a soak in the Japanese-style hot tub (robes and towels provided), an outdoor massage, yoga session on the lawn, explore the ranch, or go for a hike! On the last night we’ll party at the ranch with a special Celebration dinner. Socialize over wine and hors d’oeuvres. Reflect on the weekend, share memories with new friends about the fish you caught and the ones that got away! We will transport you to streams for fly fishing at Rainbow Falls Mountain Trout and to off-site activities at the Wild Canyon Ranch. We can provide transportation from Denver International Airport and Colorado Springs Airport for an additional fee. All gear and fishing equipment is included. Bring clothing and outer layers for a variety of possible weather scenarios such as sun and rain as weather changes quickly in Colorado. Be sure to bring a brimmed hat such as a ball-cap, and polarized sunglasses for our fishing time. The days should be very warm and the nights cool off quite a bit so make sure to bring your favorite cozy sweater!